Chinese food and Chinese Peranakan food are also popular in this cosmopolitan city and are very well frequented. Lately, more Chinese Peranakan restaurants are appearing on the scene. This is the cuisine that blends Chinese recipes with original Javanese or other Indonesian cuisines to make these distinctly their own. 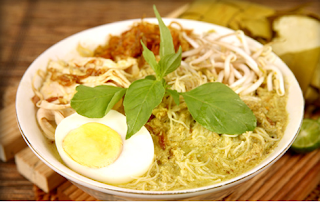 Originating along the north coast of Java, this dish, therefore, blends with Javanese ingredients and taste. Formerly served only on Cap Go Meh celebrations, which is the 15th day after Chinese New Year. 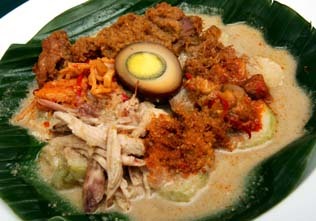 This dish which is believed to bring good luck and prosperity is now popular across Indonesia and available at any time. Lontong is a compressed rice cake rolled into cylinders, wrapped in banana leaves. Its side dishes comprise chicken boiled in coconut milk (opor ayam), fried liver sambal, vegetables cooked in coconut milk (sayur lodeh), marbleized eggs, beef floss and pickled cucumbers. The dish is eaten with a tasty soup of coconut milk that has been mixed with various herbs, like ground shallots, garlic, kemiri and coriander. This dish is similar to the Penang Laksa but, has a distinct Indonesian taste. Glass noodles are boiled to a soft consistency, this is then added with slivers of tuna fish, pinapple slices, red chili and is then drenched in clear broth, and added a mixture of bunga kecombrang and aromatic shrimp paste. To add to its freshness, lemon is squeezed over it. For a more exclusive taste try the Sop Burung Dara or the Pigeon Meat Soup. This is a clear soup filled with slivers of dove meatballs. Lotus is added to provide that crunchiness. This healthy and tasty vegetables dish consists of different kinds of mushrooms, like black mushrooms, shiitake, and champignons, as well as peas, kecambah, tofu, young bamboo shoots and corn.